The August 10 Redbirds game against the Omaha Storm Chasers was a first for many of us. It was the first time for Memphis Suit Project to be featured as the Lipscomb & Pitts Nonprofit of the Game. 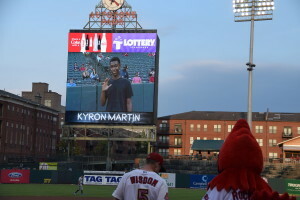 It was also the first baseball game that Kyron Martin, a junior at Hamilton High School and a student recipient from Memphis Athletic Ministries, ever attended a baseball game. And to keep with the trend of “firsts,” Kyron was given the honor to throw out the first pitch of the game! Kyron and 20 of his peers recently received a brand new suit, shirt, tie, belt, socks and shoes from Memphis Suit Project. Through MAM’s Career Readiness Program, Kyron is learning what it takes to be successful in the workplace and says that the suit the received from Memphis Suit Project gives him confidence and credibility as he interviews for employment. Memphis Suit Project is proud of Kyron and his efforts to improve his life through education and employment and is thrilled that he represented the organization so well! Previous PostGiving Back - Yes, MAM!